While driving at night your visibility is dramatically decreased since we have to rely on our headlights and street lights. You’re also more likely to encounter drunk or tired drivers and if you are in a rural area you may encounter wildlife. A typical set of low beams only illuminate 160 to 250 feet in front of your car and high beams illuminate 350 to 500 feet; when travelling at higher speeds there isn’t much room for error, so being alert and avoiding distraction are very important. At the Top Driver driving schools we work with our students to prepare them for driving during the nighttime hours and provide information to parents to help them guide their children when driving at night. 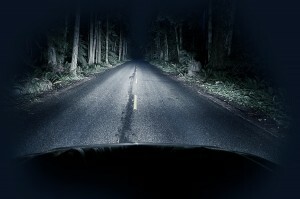 Below are a few tips that are useful for everyone when driving at night. When the lights on the vehicle in front of you (headlights for oncoming traffic & taillights for those going the same way) dim out for a moment one light at a time that generally means something ran by blocking the lights. Slow down and keep an eye out for animals on the side of the road. Another way to watch out for animals is to look for their eyes along the side of the road. Your headlights will reflect back from their eyes well before you are able to see the actual animal, so keep a look out for little circles of light. Resist the urge to stare at oncoming lights. Not only does that decrease your vision, but studies have found people will subconsciously aim towards what they are looking at. If your windshield is dirty and causing streaking when you are driving at night it’s time to clean both the interior and exterior of the glass. Windshield wipers and wiper fluid will take care of the outside, but for the interior try using a newspaper to wipe it off (it’s an old trick car dealers use). When it’s dark out it’s harder for our eyes to judge distances, so be sure to maintain a larger than normal gap between you and the car in front of you. If you start to feel tired it’s better to pull over and walk around for a few minutes to wake yourself back up than it is to try and fight it. Performing regular maintenance on your car to make sure the headlights are properly aligned and all lights are working correctly is also important. It’s important that drivers stay focused on the road while driving at night and making sure to follow the tips above will help tremendously. This entry was posted in Top Driver Blog and tagged Car Safety, How To, How to Drive a Car, night driving, Road Safety, Safety Tips, Tips.